So The Twilight Zone opens, solemnly making it clear that you, the viewer, are not in Kansas anymore. 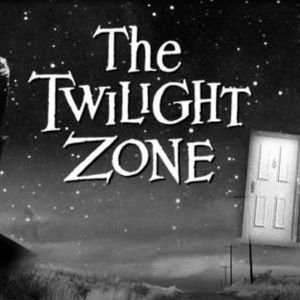 Debuting on CBS in 1959, The Twilight Zone was not the first sci-fi TV show, but it was, perhaps, the first fully respectable one. In its own day, it worked. Perhaps more surprisingly, it works in our day, too. The very conception of The Twilight Zone brings with it a disability. Twilight Zone is that rare bird, an anthology show. It is, essentially, Astounding Stories translated into the medium of television – an amalgam of short stories with no connective tissue between them. The stories share little, not even necessarily a universe; they share only the somber tones of Rod Serling’s narration. A new cast of characters is presented on the stage and then ushered off every episode, and this tends to a chilling effect. Attachment between viewers and characters can’t be developed to any real power when the characters are so ephemeral. You can’t begin any TZ episode with a sense of who the characters are, or any particular affection for them; they’re all strangers to you, after all. And for all this, The Twilight Zone works. With all its limitations it has a liberty that it fully, skillfully exploits. When all characters are one-shot characters, anything can happen to them, and it often does. The fatality rate among Twilight Zone protagonists is high. Because the show doesn’t have to resume next week where it leaves off this week, it is free to go in directions and to extents that would prove impossible for more conventional shows. It indulges ideas that could not fit into a universe less fluid and shadowy than the Twilight Zone. The show shuffles among subgenres: science fiction, folk lore, moral fables, horror – anything that might be called the fifth dimension. The Twilight Zone is a serious show: often philosophical, moralistic to its core. Some episodes are written around morals; others have their lessons attached in the closing narration. Religion is unusually present in The Twilight Zone. A handful of episodes traffic in ideas of devils, angels, and hell, but far more notable is the repeated, reverent invocation of God’s name. (God’s name, in this era of television, was not abused, but it was generally ignored.) The Twilight Zone wants to tell you stories, but it is also quite conscious, sometimes, of the desire to tell you an idea, and maybe even a life lesson. There is good reason why The Twilight Zone is a rare bird. It sacrifices the history and emotional connection of the well-done serial, and that is no small loss. At times it’s a little bleak, or a little overwrought, or a little stretched. But it holds a persistent fascination, fueled by a serious and sprawling creativity. It is good to venture into the Twilight Zone, where the normal rules are always suspended, and let the ride take where it will.